"The True Story Of The Datsun 240-Z"
With few exceptions, every book written (in English) about the Datsun 240-Z starts on a path that begins with a brief review of the corporate history of "Datsun". 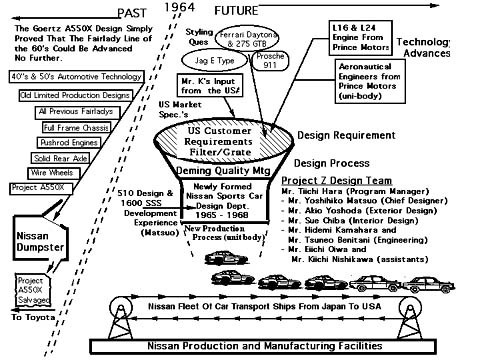 Then the story picks up with the first Sports Cars that Datsun/Nissan produced after WW II. The progression then follows the Fairlady model line to the Datsun 240-Z (also known as the "Fairlady Z" in it's home market). If one is researching an article or book about a specific Sports Car or Sports/GT that approach would seem logical. Start with the first Fairlady and follow that to the latest. The assumption being that the origins and therefore the story of the 240-Z lay in the sports cars that proceeded it in time, from the same company that created it. The progression of the model line over time must form an evolutionary path that leads directly to the Datsun 240-Z..... right? Wrong. I believe that is the trap that almost everyone writing books and articles about the 240-Z has fallen into. They simply set off on the wrong path to begin with and wound up drawing incorrect conclusions at the end. The result was my constant feeling that something was always wrong with that picture. I just couldn't point my finger at the reason why. Everyone getting started on the wrong path may have happened because they thought that the Datsun 240-Z was actually another Fairlady. It was after-all designed and produced in Japan by the same company that had designed and produced all previous "Fair Ladys" and "Fairladys". It was named the same!! Logical, simple and I believe completely wrong!. Where Then Do We Look For The Origins Of The Datsun 240-Z? What Evolutionary Pathway Should We Be Following When We Research And Then Write Its History? Here are the hyper-links I promised earlier if you would like to learn more. * Engineering and Technical Comparisons - A550X vs. 240-Z.